Sometimes I cannot believe that you would choose to spend your time watching TV when you could be doing other things.... Like feeding me or petting me or letting me crawl on you! I'm with you Tofu. It is just staggering, beggars belief, strains credulity, boggles the bwains. Doesn't Elizabeth know that not everyone has a bunny to love? 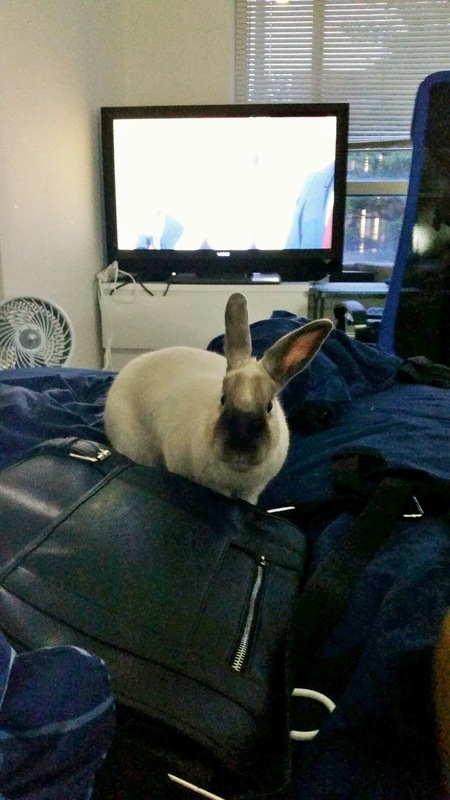 But, Tofu, I forgot to say that the bunns at the sanctuary here in Pflugerville/Austin have all insisted on wide screen TVs. Apparently, the upcoming season is going to have a special lineup that is to be interest to bunnies and yet not over the heads of their ne'r do well human's. Maybe you and Elizabeth could multitask and both be happy. I think there is an appropriateness rating for humans - complete with the acknowledgement that bunnies with humans are advised to use viewer discretion. Elizabeth will have to work out a system for holding the rabbit and petting the rabbit while watching the TV, being careful to keep her gaze mostly on Tofu with the occasional glance at the screen. Probably the result of a bad childhood for Elizabeth. You know, RG, some people might call this SUTTR. Creeps up on you sometimes ... sorry.